Genuine OEM Xerox Imaging Unit, 35,000 page yield. Xerox part number: 108R00713. Imaging Unit compatible with Xerox Phaser 7760. Compatible Xerox Toner Cartridge, Cyan, 25,000 page yield. Replaces Xerox part number: 106R01160. Color Laser Toner Cartridge compatible with Xerox Phaser 7760. Compatible Xerox Toner Cartridge, Magenta, 25,000 page yield. Replaces Xerox part number: 106R01161. Color Laser Toner Cartridge compatible with Xerox Phaser 7760. Compatible Xerox Toner Cartridge, Yellow, 25,000 page yield. Replaces Xerox part number: 106R01162. Color Laser Toner Cartridge compatible with Xerox Phaser 7760. Compatible Xerox Toner Cartridge, Black, 32,000 page yield. Replaces Xerox part number: 106R01163. 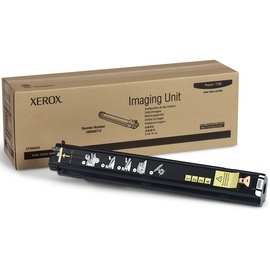 Laser Toner Cartridge compatible with Xerox Phaser 7760.